Steve in the garage with some of the firewood. He is starting up the snowblower just to make sure it is running smoothly, as a storm is due tomorrow. 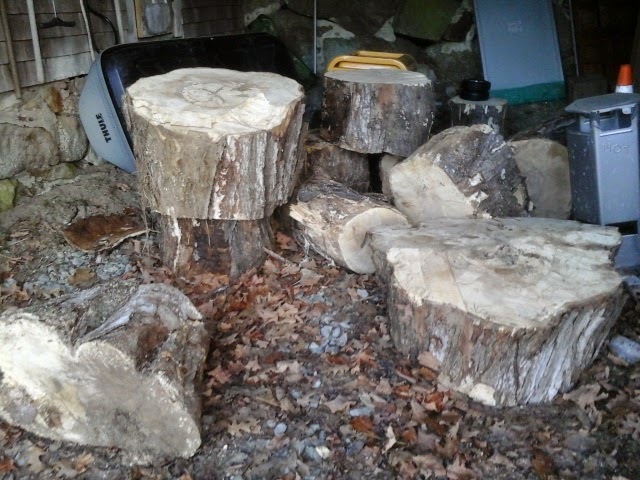 These big stumps are from a dead maple we just cut. They will take the maul and ax to split up, and then we can use the small manual hydraulic splitter to get them down to burning size. 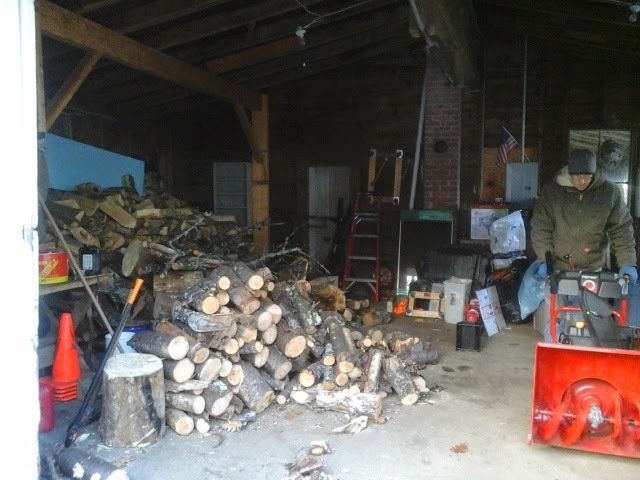 Splitting firewood is an every weekend task through winter. Steve, and sometimes me, will spend a few hours every weekend making sure we have wood split and ready.. Our main source of heat is a wood stove. Gotta have wood. We have been in the house about four weeks now, though most of that time has been just unpacking and trying to figure out where things will go. The garage is still a work in progress in that regard ... as you can see, things are stacked everywhere! We signed papers on the house, and snow began falling as we finished up with the attorney. It quickly turned into a major snow event, and by the time we got to the house, the power went out almost immediately. So we spent the first several days with no power, no heat, and the furniture hadnt arrived yet. We huddled in camp chairs with our sleeping bags and headlamps. After experiencing a long term,(two weeks) major, widespread ( half the state) power outtage some years ago, we are never without back up heat and electric and the ability to cook. That means a wood stove, gas cooking options, various types of power back up such as a generator. But the storm that landed the day we bought the house just came too quick for us to have these systems in place. It was mighty cold, and dark. ditto with the gas stations. Pumps cannot operate without electricity. Banks and ATMs cant operate. The cash you have is all you will have till power is restored. If the power is out for a really long time, water delivery and sewage treatment will be affected. Think about that for a minute. If you have your own well, do you have a way to get water when the pumps cant operate? If you dont have gas on hand to fill your car, and you cant get news to find out where there might still be operating gas stations, you are stuck. Those are just a few of the lessons we learned from that ice storm. Being self sufficient means we need to be able to manage on our own if a storm or other disaster takes down the power, whether for a few hours, or a few weeks. Right now, we have options for light, heat, cooking, water, news, and we store extra gas to fill the vehicles. And i am confident we could easily make due with food in the pantry for more than two weeks. Weather today:27 at 8am, high was just about 32, but windy, cloudy, light flurries of snow, and felt very cold. wildlife: in addition to the usual birds at the feeder, we saw a goldfinch in winter plumage. And on our run, a porcupine lumbered acdoss the road, defying my camera by scrambling up a tree. daily run: a 10.5 miler on roads. Go to the ant. Consider its ways and be wise. It has no commander, no overseer or ruler, yet it stores its provisions in summer, and gathers its food at harvest.